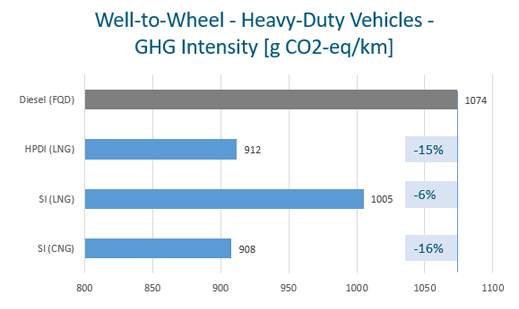 Having accurate, updated and reliable GHG inventory data is key to understanding the current advantages, as well as the future potential for supporting Europe’s activities in developing a strategic vision for real sustainable mobility. NGVA Europe, supported by a wide partnership of industry organisations, commissioned the leading global consultant and software company in the Lifecycle Analysis (LCA) domain, thinkstep, to perform an industry-wide analysis of the supply and use of natural gas in Europe, not only with regard to road vehicles (Well-to-Wheel) but also including maritime vessels (Well-to-Wake) and power generation (Well-to-Grid). 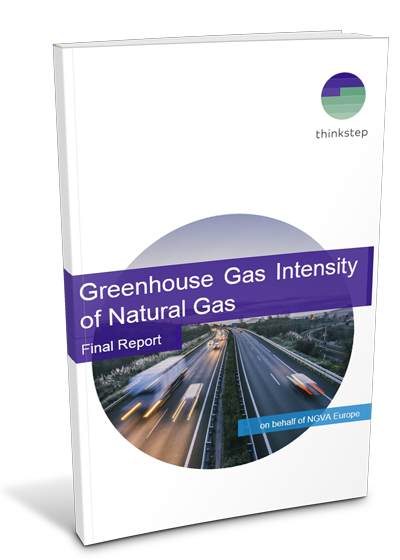 The study includes a deep and fully comprehensive analysis of the current state, as well as an outlook to 2030 on the natural gas supply chain, and the performance of NGVs. This study also represents a relevant reference for future studies on the matter. The goal of the study is to provide high quality, reliable, and up-to-date industry-based lifecycle data to inform the public and support dialogue with external stakeholders and policy makers. It is also intended to contribute to an informed debate during the revision process of the different policy actions dealing with clean and efficient mobility. 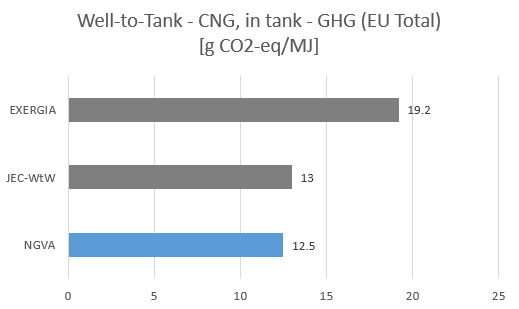 The results of the study show the European total carbon footprint of CNG on a Well-to-Tank basis of 12.5 g CO2-eq/MJ), as average weighted value considering the different EU sources for natural gas supply. These results are aligned with the value (13.0 g CO2-eq/MJ) issued from the WtW Study from JEC (JRC – Concawe – Eucar), while the EXERGIA report shows 35% higher values (19.2 g CO2-eq/MJ). 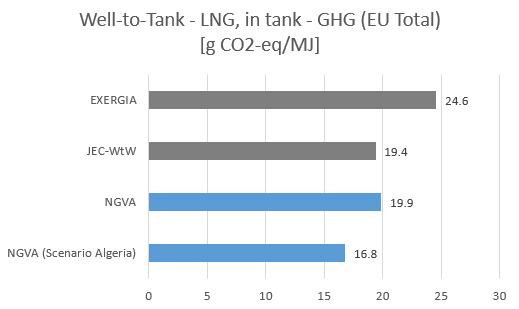 Concerning the LNG Well-to-Tank pathway, the results are in line with the data from the WtW Study from JEC3 (19.9 g CO2-eq/MJ compared with 19.4 g CO2-eq/MJ). The analysis carried out considering the different LNG sources has also indicated a wide variability of data due to different ages and technologies used in the plants. Best practices already exist and, concerning LNG, there is a concrete capability to reduce the average value from 19.9 g CO2-eq/MJ down to 16.8 g CO2-eq/MJ (e.g. the phasing out of older liquefaction plants and technologies as in Algeria). With a progressive alignment of the technologies even further reduction can be achieved. Conversely, the results from the EXERGIA study indicate much higher values (24.6 g CO2-eq/MJ vs 19.9 g CO2-eq/MJ), due to different and older data sources. 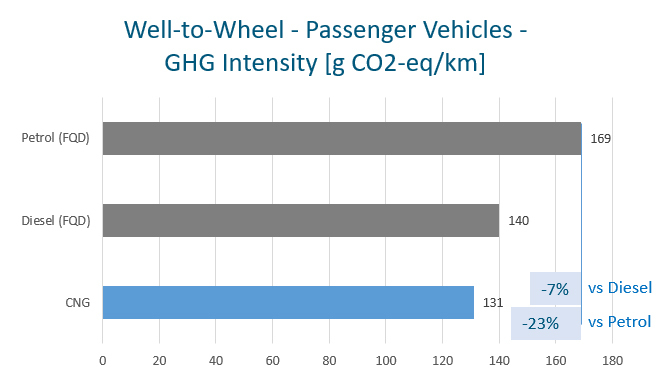 Considering the overall Well-to-Wheel (WtW) impact, there are significant benefits and reduced GHG emissions from passenger cars as well as light and heavy-duty vehicles when switching to CNG or LNG from petrol and diesel. For passenger cars, on a WtW basis, natural gas reduces GHG emissions by 23% compared with petrol and by 7% compared with diesel. In heavy-duty applications, benefits compared to diesel amount to 16% for CNG up to 15% for LNG. In maritime applications, the use of LNG provides an overall Well-to-Wake benefit up to 21% compared with conventional HFO (Heavy-Fuel Oil) fuels. It is important to highlight that the GHG results have been calculated taking into account all possible GHG sources (carbon dioxide (CO2), methane (CH4) and nitrous oxide (N2O)) along the entire value chain, and includes a detailed description of all sources in the different steps, from gas extraction to end-use. NGVA Europe’s members also commit to “Zero Venting Target” policy for all new CNG and LNG retail stations. This means that in order to meet this commitment CNG and LNG retail stations will be designed in such way that methane emissions from venting operations are minimised at all times during operation. Over the Well-to-Tank side, there is a general misunderstanding about methane emissions from vehicles (often referred to as “methane slip”). No natural gas leakage comes from engines or vehicle. Only very low methane emissions as exhaust unburned hydrocarbons are generated, and they are taken into account as CO2-equivalent. Such variability of data demonstrates that best practices exist with many already in place and delivering good results. It is also evidence of the additional potential for further reducing GHG emissions. 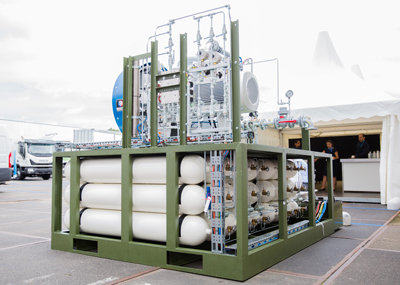 For example, the installation of compressors at LNG terminals allow the re-injection of the boil-off gas instead of flaring it, or a wider use of leak detection systems and repair campaigns aimed at reducing fugitive emissions. The gas industry is fully committed to, and is working on, filling any remaining gaps by means of new abatement opportunities and by introducing more-efficient technologies. For more information about the consultancy company that performed the study (thinkstep) and contact information, visit their website at https://www.thinkstep.com/.